I just started watching thiz show on crunchyroll.com and I’m already hooked! It’s a true historical about a ronin, Kansuke Yamamoto who rises to power in feudal Japan as a master battle strategist. It has everything: samurai, sword fights, romance and the usual Greek style family dynamics. Oh, and it also has Gackt as Uesugi Kanshin, a warlord. He hasn’t appeeared yet – that comes much later, but I’m really looking forward to it! 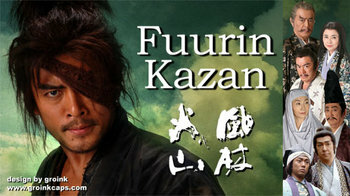 Fuurin Kazan also stars one of Japan’s greatest actors, Tatsuya Nakadai. He was one of Akira Kurosawa’s stars who often played across from Toshiro Mifune as a rival samurai. Anyway, the series is beautifully done and acted with a neat opening sequence. I highly recommend it to fans of samurai film and history. It’s great, isn’t it! I’m completely hooked, but it took me at least six episodes to get my head around all the different factions and who was on which side. I’m also looking forward to Gackt!